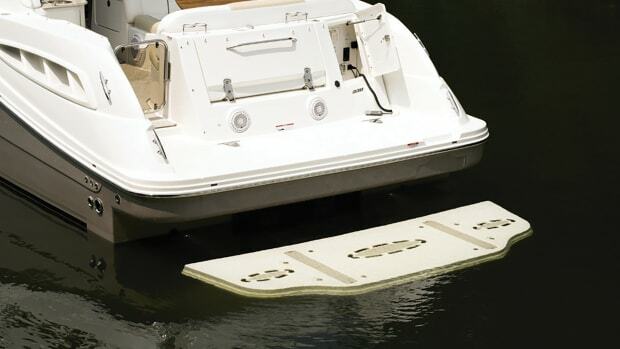 Maintaining gyro stabilizers keeps your boat on an even keel. Tired of losing your lunch in the troughs? Add a gyrostabilizer and stay on an even keel. I wish I had a dollar for every hour I spent as a paid captain looking at the upturned bottoms of my guests—and occasionally crew—doubled over the rail tossing their cookies, thanks to a less-than-glassy sea. I probably wouldn’t have enough to buy a Seakeeper gyrostabilizer, but I’d be on my way. And I’d gladly pony up the rest out of my retirement fund if it meant not having to deal with the results of mal de mer. (Not everybody makes it to the rail.) A gyro can reduce roll up to 90 percent, thereby making boating fun for about 90 percent more people, and 100 percent more captains. But what’s involved in installing and maintaining a Seakeeper? Here’s an introduction. 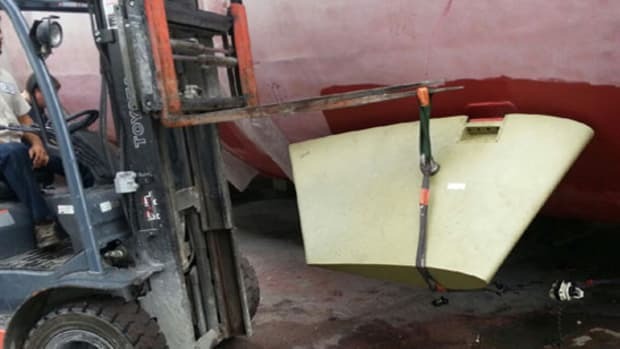 Anyone who’s been around powerboats for a while knows about fin stabilizers, rudder-like appendages on either side of the keel that counteract rolling by deflecting water moving across their surfaces when under way. Some fins also stabilize at anchor, with a “paddling” motion. There are non-fin designs, too, that use different principles to provide at-rest stability. All of them involve external appendages that are susceptible to damage, fouling, and so forth. Gyrostabilizers, on the other hand, never get wet and don’t have any parts sticking out of a boat’s bottom. In fact, they don’t interact with the water in any way. The Seakeeper 3 mounts on deck in a leaning post. Several companies build gyros for yachts and small commercial craft. VEEM (veemgyro.com) and Tohmei (antirollinggyro.com) are two major players. VEEM active-control gyros are for boats 75 feet and up, or thereabouts; they’re great for megayachts, but not for the boats most people own. Tohmei gyros use a Mitsubishi-designed passive system developed for satellites; a passive gyro operates without external control, other than the motor that spins it, letting physics do the work. Advocates of passive-control gyros tout their simplicity and need for virtually no maintenance; critics note their tendency to be ineffective in calm weather and over-exuberant in rough, putting excessive strain on their mounts until they have to be shut down before causing damage. A stabilizer that can’t operate in rough conditions? Kind of defeats the purpose, I’d say. 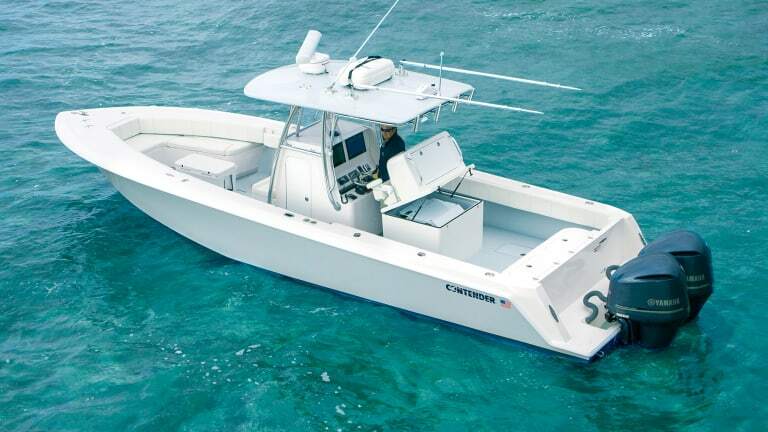 The gyro builder du jour is Seakeeper (seakeeper.com), with an array of active-control models to fit commercial and pleasure boats as small as 30 feet. With active control, the speed and angle of gyroscopic precession (a gyro’s tendency to react to an input force at right angles to said input force) is controlled by hydraulic rams, which are, in turn, controlled by input from sophisticated sensors. Active control makes the gyro more efficient and more effective over a wider range of conditions, including very calm and very rough seas, without operator input: It’s all done by a computer. 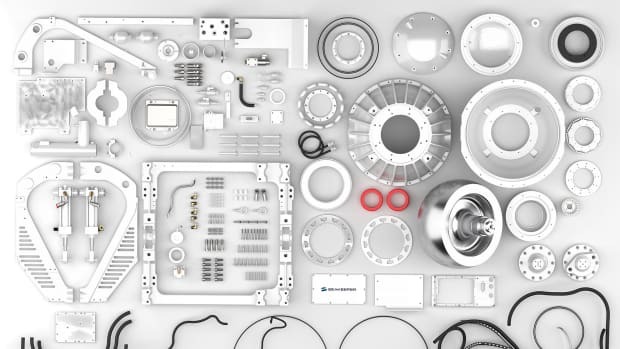 Active technology also adds expense, complexity, and maintenance, but those are trade-offs that top-notch yacht builders accept. 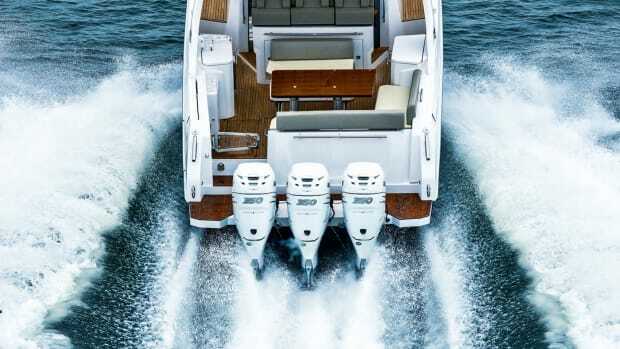 Many now offer Seakeepers as options, and some, including MJM Yachts, include them as standard equipment. Bob Johnstone has been around boats for a long time, so if he says something is worth having, it most likely is. And Johnstone, president of MJM Yachts (mjmyachts.com), does more than talk about Seakeeper gyrostabilizers—he’s one of their biggest advocates. 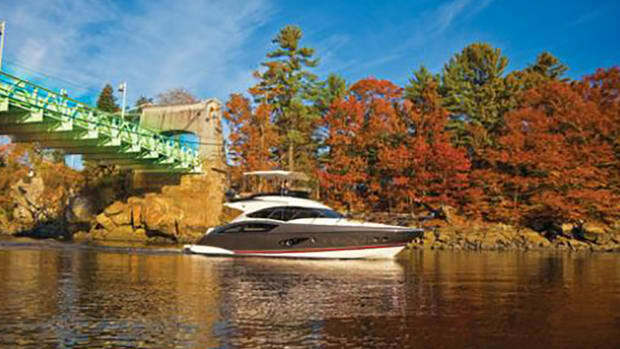 “It’s the most important innovation in powerboating in the last 10 years,” Johnstone said. “It’s like a rock in the water. Waves try to rip the hull off the rock, but they can’t.” Johnstone says a Seakeeper reduces roll by more than 90 percent. He includes one as standard on his MJM 50z and as an option on other models. 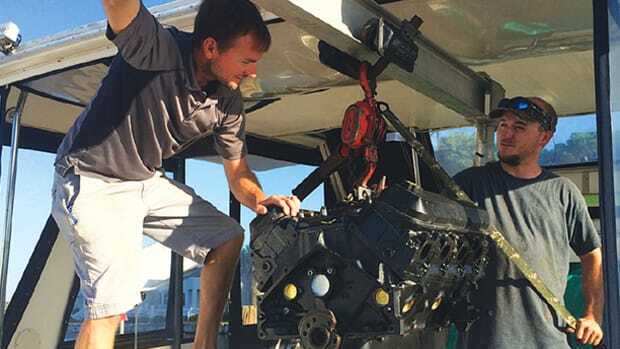 “You don’t want to buy a boat without one,” he said. 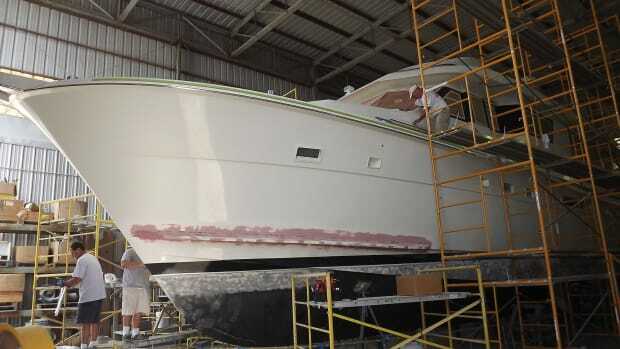 Not everyone can swing a new boat, so what about retrofitting a Seakeeper? Johnstone says the gyro has to sit on “fairly substantial” structure. 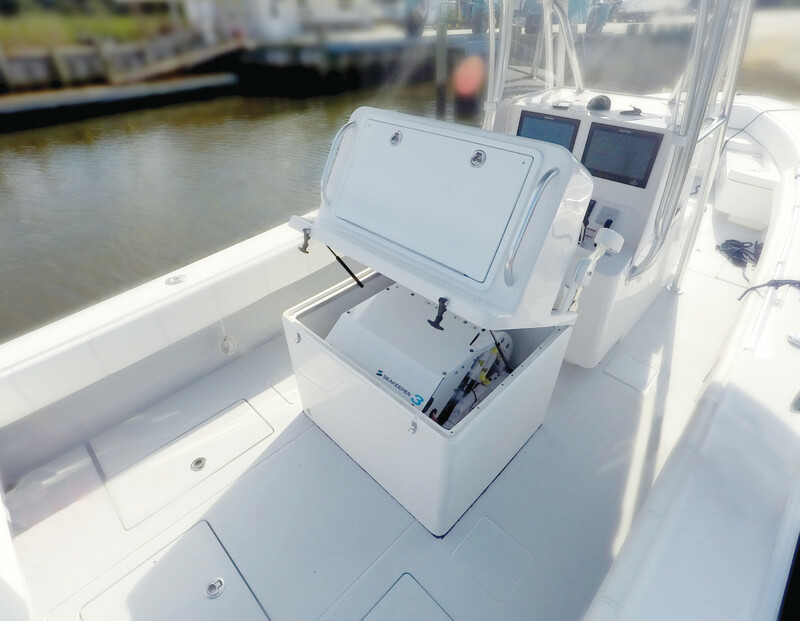 MJM installs stringers to accept the Seakeeper, but many boats will need additional support, adding complexity and expense to the job. Placement is also an issue: A Seakeeper is heavy—models range from 550 to almost 4,000 pounds, plus the additional weight of extra structure and ancillary gear. It doesn’t have to be mounted on the centerline from a functional standpoint, but centerline-focused weight is a factor in maintaining proper trim, said Johnstone. In most retrofits, the Seakeeper can be tied into existing stringers, said Brook Stevens, regional sales manager at the company. Sometimes the stringers have to be sistered to get the right span for the mounts; this is figured out on a case-by-case basis, he said. 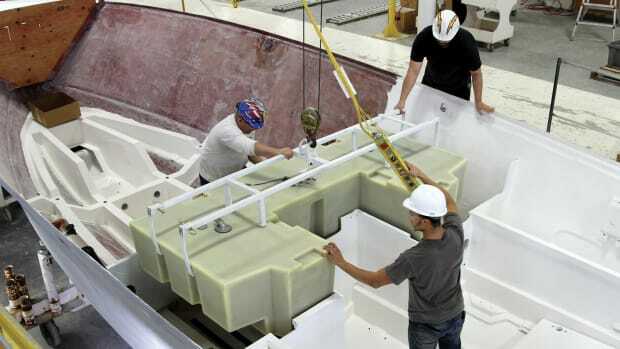 Once the support structure is built, the Seakeeper—with a rotor that lives in a vacuum-sealed sphere that pivots fore and aft, supported by a sturdy steel cage that also holds the hydraulic active-control cylinders—can be secured either via metal plates glassed inside the stringer and tapped to receive mounting bolts or via tapped saddles that fit over the stringers and are glued in place with Plexus or another high-tech adhesive. Every Seakeeper installation is a custom job that should be carried out by authorized technicians, said Stevens. When planning a retrofit, contact the company first, he added. Engineers there can provide advice, and a list of certified installers. “We try to get involved in every project,” Stevens said. Not every Seakeeper has to live in the bilge. The smallest model, the Seakeeper 3, can literally be glued down onto the deck. Designed for boats from 30 to 39 feet, and ideal for center consoles that spend a lot of time trolling at low speeds offshore, the 3 can be mounted in a box that replaces the boat’s existing leaning post. The box is glued to the cockpit sole; the Seakeeper is dropped inside, and the seats, backrest and other leaning-post accoutrements are mounted on top. Nautical Design (nauticaldesigninc.com) in Harmony, Pennsylvania, by the way, is one supplier of custom leaning posts to cover the Seakeeper 3. The Seakeeper 3 is also the only model that runs on 12-volt power rather than alternating current. It draws 900 watts on start-up, a bit less in operation, so no generator is required. Most boats will benefit from an extra battery, though. 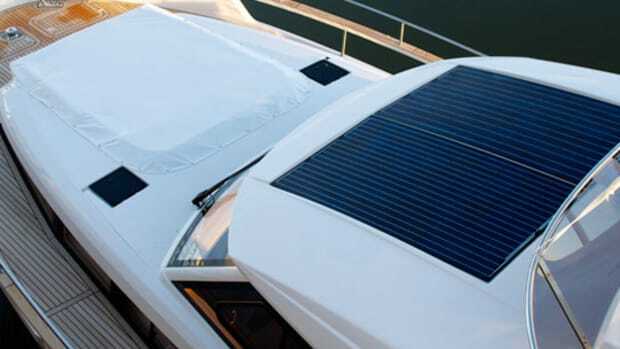 The other Seakeepers require at least 120-volt AC power, which means the genset runs whenever the Seakeeper is on duty. Most folks run the genset all the time anyway. At the dock, where Seakeeper makes partying a lot more comfortable when boat wakes roll through, shore power does the job. The Seakeeper maintenance schedule is about as easy as anything gets on board a modern boat. Basically, you perform an inspection of the cooling, hydraulic, and electrical systems every year (or every 1,000 hours of operation, whichever comes first). 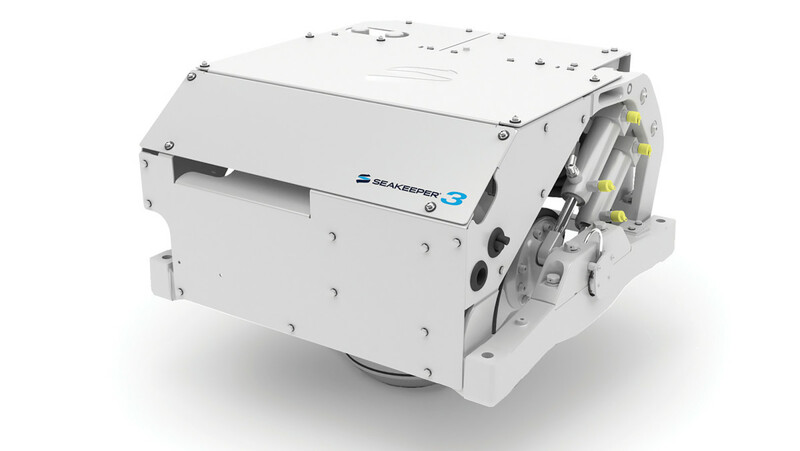 The hydraulic and cooling systems of the Seakeeper 3 should be flushed at the same intervals, but the larger models require major service every 2,000 hours. Detailed maintenance schedules are included in the operator’s manuals available for download on the company website. The manuals also provide instruction on how to use the Seakeeper; they’re worth a read before getting started on a retrofit. Each Seakeeper includes a raw-water pump to cool its heat exchanger, which, in turn, cools the unit’s hydraulic oil, so the pump needs to be checked like any other water pump. The hydraulic cylinders that control the rotor move almost constantly, which generates a lot of heat, so keeping the cooling system up to snuff is important. Frequent checks and replacement of the zinc anodes is also advised. And if any salt water gets on the Seakeeper’s exterior, it’s important to clean it right away with soap and water to prevent corrosion. If you’re as sick as I am of looking at inverted derrieres while your seasick guests inspect the waterline, think about cashing in some stock and retrofitting a Seakeeper. If you do, some folks might come back for a second cruise. The Seakeeper 3 is designed for boats from 30 feet. While I was writing this column, several people asked me if installing a Seakeeper would affect steering by preventing the boat from heeling into a turn (or out of it, for some displacement hulls). And if it did, how would that affect the boat’s handling? Funny, nobody asked the same question about fin stabilizers, which also sense heeling and adjust the fins appropriately. But maybe it’s because gyrostabilizers have that “high tech” thing going on. The key phrase here is “on its stops.” The Seakeeper reacts the same as the toy gyroscopes we all enjoyed playing with as kids. When a gyroscope, whether balanced on a string held by a 10-year-old, or mounted in a gimbaled sphere on a boat, is acted on by a side force, it reacts by moving, or “precessing,” at right angles to the direction of that force. (If you want to know exactly why, Google it. It’s all about angular torque.) Precession creates an immediate counter force, at right angles to the precession and in the opposite direction of the original force, which restores equilibrium. When the precession stops, the counter force stops, too. The Seakeeper’s gyro is a heavy, rapidly spinning rotor inside a mount that can only tilt forward or aft, in what engineers call the “pitch plane.” It’s fixed in the athwartships plane. When the boat rolls, the Seakeeper senses the roll as a side force, and the rotor instantly precesses at right angles to it—either forward or aft, depending on the direction of roll. This creates the counter force that damps the roll. The strength of the counter force depends on the speed of precession. In normal rolling at sea, the boat heels one way, then the other, and the gyro responds accordingly, precessing this way and that, and maybe never hitting the stops. But crank the helm over and the boat leans and stays put; the gyro precesses and quickly reaches the end of its range, with the heeling force still acting on it. When it stops, its counterforce stops, too, and so does stabilization. Without precession, no opposing force is generated. After an instant of minimal resistance, the boat steers, and heels, normally, with the rotor all the way forward or aft. When the boat levels out, the rotor returns to normal operation. If this were not the case, the Seakeeper could double as trim tabs—automatically offsetting any heel from wind, poor trim, fat Aunt Sally sitting on the gunwale, and so forth. Precession happens on its own—it’s physics—but in an actively controlled gyrostabilizer like the Seakeeper, the hydraulic cylinders control the rate of precession and the precession oscillation range, constraining it to optimal limits. Left to its own devices, in certain conditions, such as boisterous seas, the drastic rolling of the vessel could, theoretically, cause the gyro to precess too rapidly and develop counteracting torque too great for the mounting structure to handle. Again, that’s the argument against passive gyrostabilizers. Gyros work better when they’re under control.